The STEEM price is down 14.31% verse the USD over the past 24 hours on lower volume ($6,583,070) as Bitcoin falls to $8.24k and the broader market is following down. STEEM is losing ground verse Bitcoin as Korean trading falls to 35% of the trading volume. The strong downward movement of Bitcoin is the primary driver of the current fall in STEEM, wait to see if it stabilizes before STEEM moves up again. New account creation is strong with 1,000 new accounts created in the past 24 hours. The % vested indicator is flat at 71.25% on steady power downs and lower power ups. Daily active accounts is up at 62,117 accounts executing transactions in the last 24 hours. SBD is at $2.24 on Bittrex which is still very elevated over the peg, receive you rewards in 50% SBD and then use the SBDs to buy STEEM on the exchange. SBD conversions are a waste of money again! 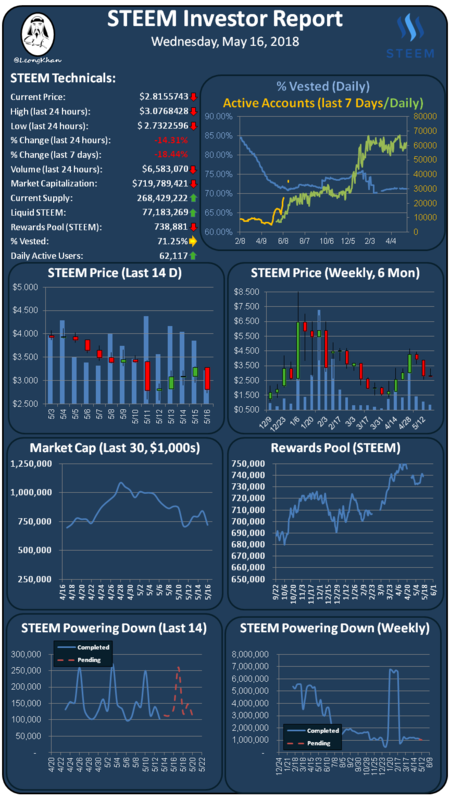 For traders, I believe STEEM is fairly valued around the $3 level even after SBD returns to the $1 peg. If SMTs and communities have the expected impact of broadening the use cases of the STEEM blockchain, STEEM could be fairly valued at $8 or more. On the investor side, I believe we will be significantly higher after communities are released and the account creation problem is solved (the timeline for this is currently unknown). I would power up your rewards and buy STEEM below the $3 level. The report published above is based on my assessment of the cryptocurrency market. Investors should consider this report as only a single factor in making their investment decision. All investments involve market risk, including possible loss of principal invested. The author is a cryptocurrency investor and while he seeks to provide honest assessments to the best of his ability may have a conflict of interest that could affect the objectivity of this report. I'm a member of the SmartSteem team. Earn income by selling your votes or promote posts by buying votes through the banner below (referral link).